Live lining for Rockfish has been good at Gum Thickets which is North of Bloody Point Lighthouse, using live Spot, and cut Spot (since the Spot are large) and, there are a few Bluefish mixed in. Most of the charter captains have been catching their Spot and some Croakers in the Choptank around the #10 buoy. Additionally, Spot have been caught right outside the Rod 'N' Reel Harbor in 12-18 foot of water and behind Poplar Island in 10-20 foot of water. A number of fishermen have been trolling using surgical hoses and Drone and Clark spoons from Herring Bay to Parker’s Creek in 25-35 foot of water catching Spanish Mackerel and Bluefish with a few Rockfish mixed in. Remember when trolling for Spanish Mackerel your boat speed should be 5-6 knots. A few mackerel and Bluefish have been caught from Poplar Island to the False Channel in 25-35 foot of water. North Beach and Breezy Point Piers has been producing Bluefish, Spot and White Perch using bloodworms, squid, shrimp and some peelers. 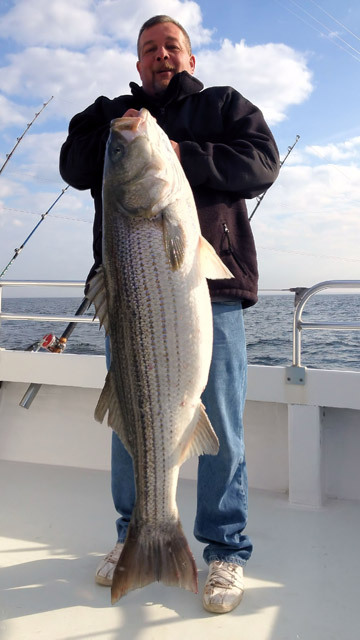 Bob Critcher (shown above) was fishing aboard the Wound Tight early in December when he caught this behemoth Striped Bass that was 52" long and weighed in at a whopping 54.65 lbs. Remember, if it's fishing related and Tyler's doesn't have it, you probably don't need it. Remember too that if you can't come to us, we can ship tackle to you!